Please see the individual RFQ, RFP, RLOI, or ITB for specific instructions regarding the information to be included in your response, important dates, and other necessary requirements. Individual requests are listed below. Click here for 2017-2018 solicitations. This is a RBCDC request. The 2018 Annual Report can be viewed by clicking the image below. Click here to view the Annual Report for previous years. 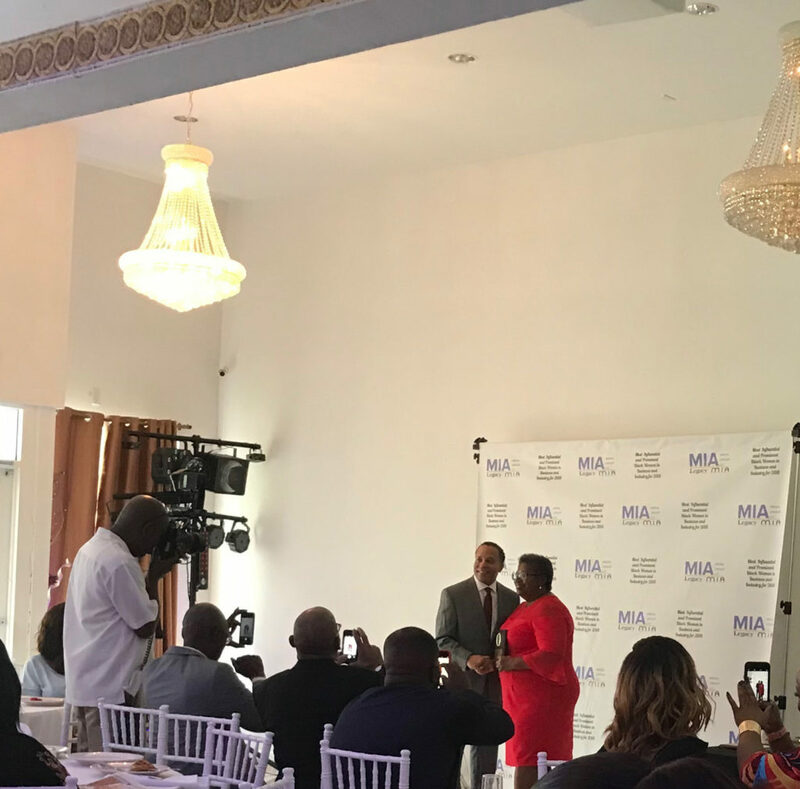 Riviera Beach Community Redevelopment Agency (RBCRA) Neighborhood Services Director, Annetta Jenkins was recently honored as one of South Florida’s Most Influential and Prominent Black Women in Business and Industry of 2018 by Legacy South Florida on December 8, 2018. 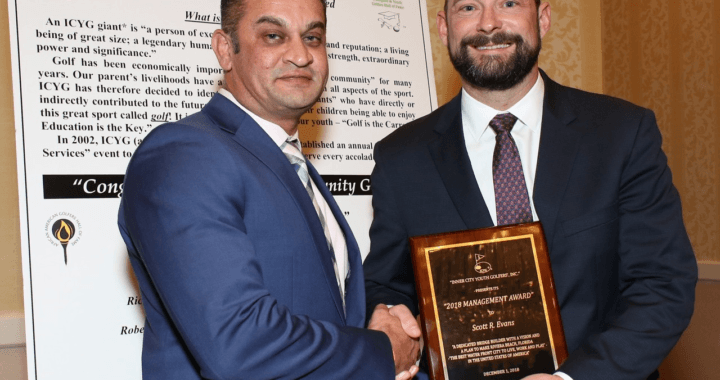 Honorees were nominated by the community at large, then carefully vetted and selected by a highly accomplished selection committee comprised of former honorees, business, and civic leaders from South Florida. Legacy prides themselves in showcasing the best and brightest stars with a commitment to serving others in the community. The honorees embody dedication, prestige, honor, service, class and leadership. Without a doubt they are true role models for South Florida’s community. “I am honored, humbled, and proud to be among such distinguished and awesome company,” said Jenkins who is a seasoned community development professional with more than 30 years of national, statewide, and local experience. She is currently the Director of Neighborhood Services for the Riviera Beach CRA and Executive Director of the Riviera Beach CDC. 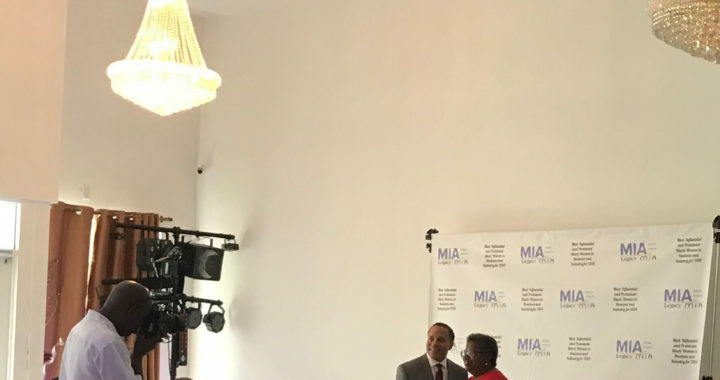 She formerly served as the Assistant Director for Miami-Dade County Department of Housing and Community Development as well as the Executive Director for South Florida LISC. She also serves on Palm Beach County’s Housing Leadership Council. Among the many titles Jenkins holds, she has a genuine passion for changing the community that she serves by bringing unique and impactful projects, events and programs to local children and families. In 2018 Jenkins spearheaded the Annual Palm Beach County Youth Sports & Fitness Expo that exposed local children to over twenty-five traditional and non-traditional sports. The goal of this event was to bring these sports into the community in hopes that they lead to future scholarships for local youth while encouraging fitness and fun. Jenkins also lead the planning committee for the Riviera Beach 2018 Inaugural Tree Lighting Event. This event was hosted at Riviera Beach Marina and showcased a huge tree, night market, snow, entertainment, and of course Santa. Citizens of Riviera Beach and Palm Beach County came in the thousands in anticipation of this event which was made possible by the strategic and passionate leadership of Annetta Jenkins. Jenkins is spearheading several projects that will create housing for the City’s workforce. Along with millions of dollars raised for community development, she has also been responsible for a number of awards for her agency. Inner City Youth Golfers Inc., (ICYG) honored Riviera Beach Community Redevelopment Agency (RBCRA) Interim Executive Director, Scott Evans with the 2018 Community Giants Award on Saturday, December 1st. The awards ceremony took place at the Palm Beach Gardens Marriot, located at 4000 RCA Blvd from 5:30-10:30pm. The event fostered an impactful evening honoring Palm Beach County leaders that have directly impacted their communities in partnership with the organization. ICYG recognizes a community giant as a person of exceptional ability, importance and reputation. They have a goal to make some of our inner cities better places to live, work, shop, and enjoy life a little bit better through the sport of golf. 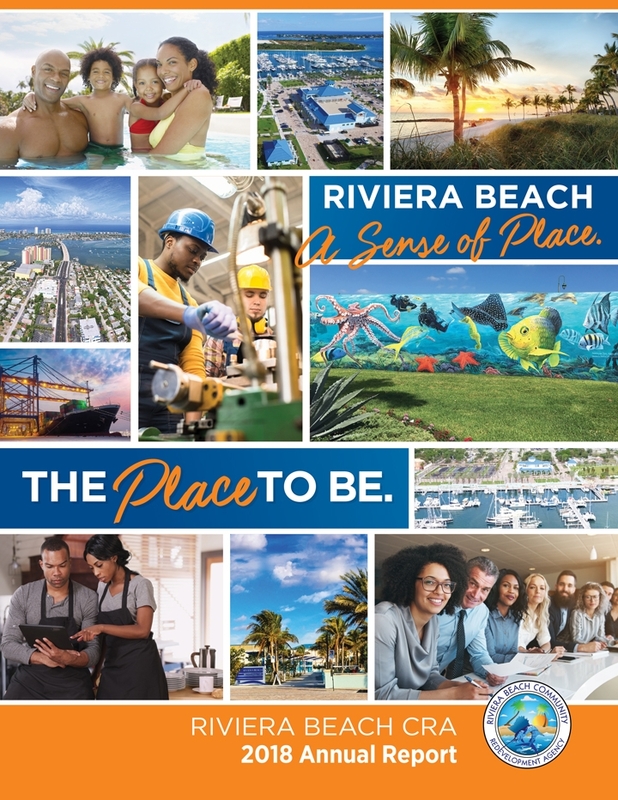 As a leader, Evans has been heavily involved in the implementation of improvement initiatives and community impact programs within the City of Riviera Beach. “Scott is a transformative leader who provides his subordinates complete latitude to execute their assigned projects. He motivates our team to face challenges and think beyond the impossible, which has resulted in the completion and success of many initiatives”, said Andre Lewis, Project Manager, RBCRA. For many years golf has been economically important within Palm Beach County. ICYG recognized Evans as a Community Giant due to his involvement and contributions to the future of our children being able to enjoy this great sport. “Scott Evans has quietly labored for the citizens of Riviera Beach for many years, starting in its City Planning Department. 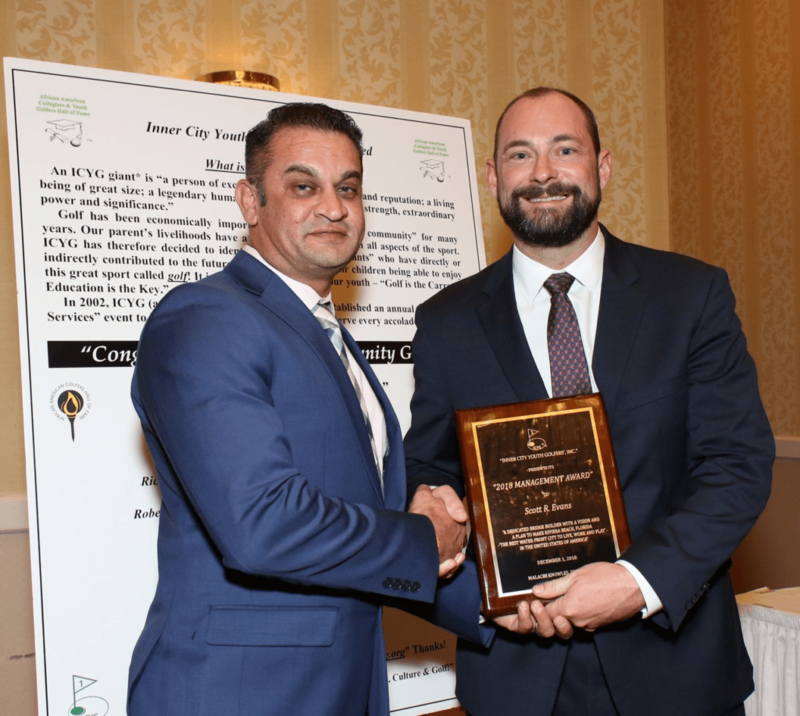 It was with great pleasure that I, as Founder of ICYG, bestowed the ‘2018 Community Giant Award’ to him which read ‘A dedicated bridge builder with a vision and a plan to make Riviera Beach, FL The Best Waterfront City to Live, Work, and Play in the United States of America on December 1, 2018,” said Malachi Knowles, President and Founder of ICYG. Many parents within the community’s livelihoods have and continue to depend on the sport as involvement often leads to future scholarships for their children. 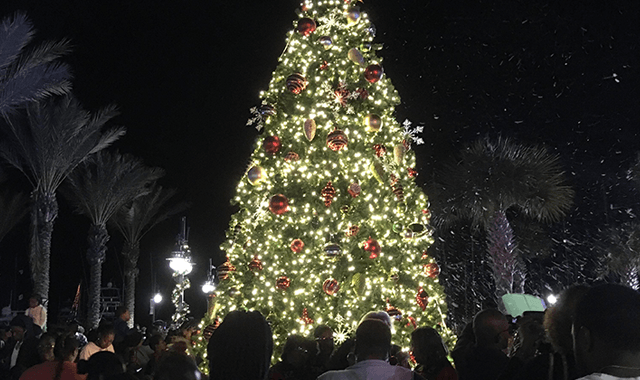 The Riviera Beach Community Redevelopment Agency (RBCRA) in conjunction with the City of Riviera Beach, hosted the inaugural Winter Wonderland at the Marina Holiday Celebration on Friday, December 7, at the Riviera Beach Marina Event Center. Over 3,200 Palm Beach County residents and residents from surrounding counties attended the event, surpassing the RBCRA’s goal of 1,000. The main highlight of the event was the tree lighting ceremony that took place at 7 p.m. Thousands of attendees gathered in the Marina’s courtyard and participated in the count down to the lighting of the magnificently decorated 20 ft. tall tree that will be housed at the Marina for the remainder of the holiday season. Children and families were pleasantly surprised with the release of snow at the end of the ceremony, upbeat music provided by Digital Vibez Inc., as well as free cookies, hot cocoa and small gifts for children. Immediately following the tree lighting ceremony was the arrival of Summer Santa Claus who was escorted to the event in a fire truck parade by the Riviera Beach Fire and Police departments. Santa waved and smiled throughout Riviera Beach with holiday music and sirens blaring in the background, bringing joy not only to event attendees but also to the community. A giant adirondack chair created by Youth Empowerment Program (Y.E.P.) and Riviera Preparatory students housed Summer Santa, allowing him to take free pictures with children and families. The chair will remain at the Marina throughout the year and will be used as a focal point for visitors. The event also featured a mailbox where children sent postcards to Santa, musical performances by local choirs and youth, TikiMarket vendors, a free photobooth, and an adult only tent featuring a fruit and cheese display, wine, and live Jazz music. 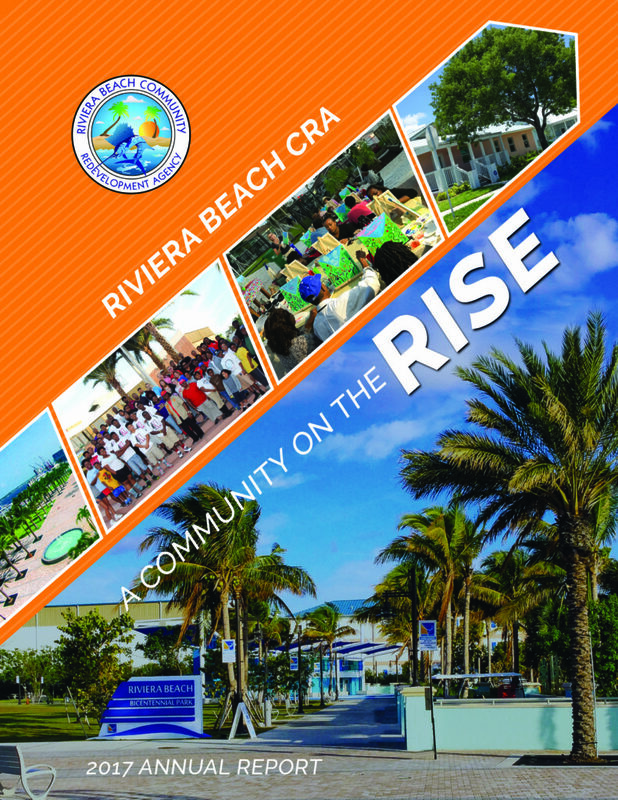 This inaugural event was one of many new initiatives launched by RBCRA to expose local children and families to new and unique opportunities in the City of Riviera Beach. Winter Wonderland at the Marina brought fun and families together to enjoy the holiday spirit. 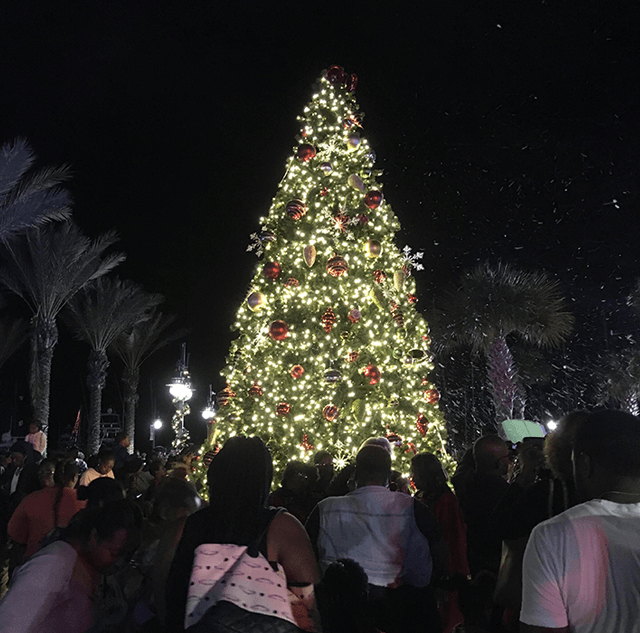 “The inaugural holiday tree lighting event was a shining example of the best Riviera Beach has to offer. Residents and friends from around the region came out as we show cased our children and businesses. We were able to embrace each other across all sorts of diverse lines: appealing to children, millennials, and grandparents like myself. 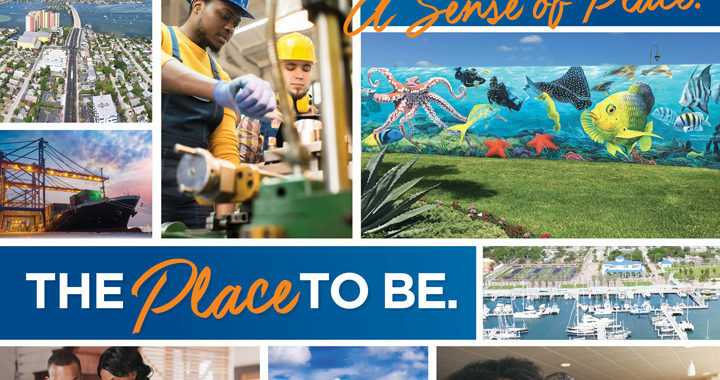 We say Riviera Beach is the best place to live, work, and play. That was personified on Friday night.” said Annetta Jenkins, Executive Director of the Riviera Beach Community Development Corporation (RBCDC). ” Winter Wonderland at the Marina was made possible through RBCRA in conjunction with local community partners and sponsors. Please see the individual RFQ, RFP, RLOI, or ITB for specific instructions regarding the information to be included in your response, important dates, and other necessary requirements. Individual requests are listed below. TikiMarket is back from vacay! with a four o’clock Happy Hour state of mind! TikiMarket presents MARGARITAville Island Escape! Beginning 4 pm- with Caribbean rock-n-roll & margarita bar! Celebrating Riviera’s birthday with Coconut Rum Cake! Featuring, Polynesian dancers with an authentic fire dancer! TikiMarket has something Amazing! for everyone with our selection of freshly prepared foods, fresh fruits, vegetables, Island-y eats & more! Local artisans offer a cool array of handcrafted & island-y goods, jewelry, fashion, vintage flea and other unique gems. 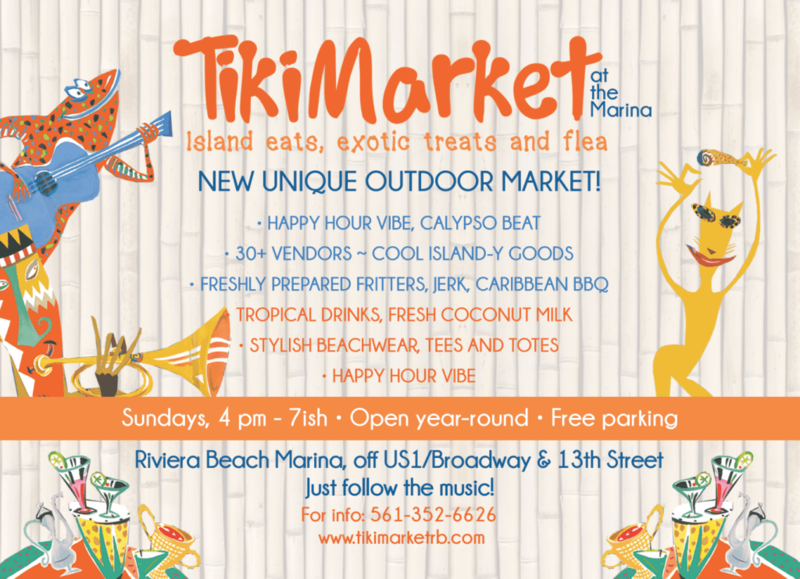 TikiMarket at the Marina, dubbed “a taste of the islands without leaving town,” operates every Sunday from 4 pm to 7-ish, rain or shine. Café tables decked out with Tiki umbrellas make a great setting for kicking back and enjoying the market’s freshly prepared Caribbean fare, against a breezy and picture-perfect backdrop of island escape boats! 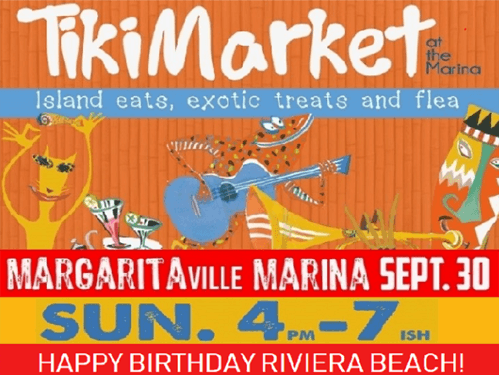 Sponsored by the Riviera Beach CRA, the TikiMarket is located on the slip side of the Marina, off US 1/Broadway and 13th Street. (Just follow the music!) Parking is free, and dogs on leash are always welcome. The market is also accessible by boat, water taxi and the Peanut Island Ferry. The 2017 Annual Report can be viewed by clicking the image below. A unique outdoor market will open Sunday, March 4th along the waterfront plaza at the Riviera Beach Marina Village, a celebration of the city’s cultural and historical connection to the Caribbean Islands, especially the Bahamas. 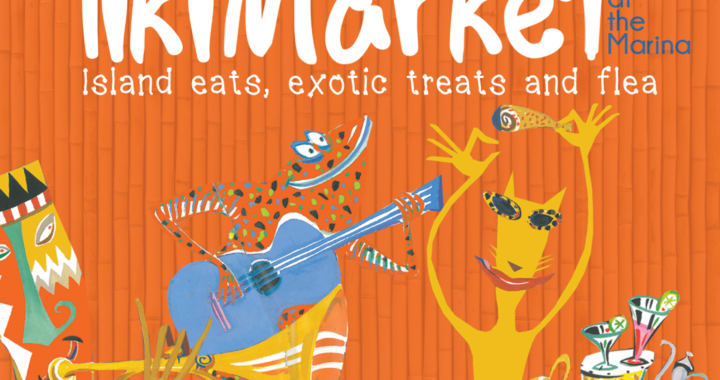 TikiMarket will be open year-round from 4 to 7 p.m. each Sunday at the Marina, located at 190 E. 13th Street. It is free and open to the public and vendors can still register by calling 561-844-3408. 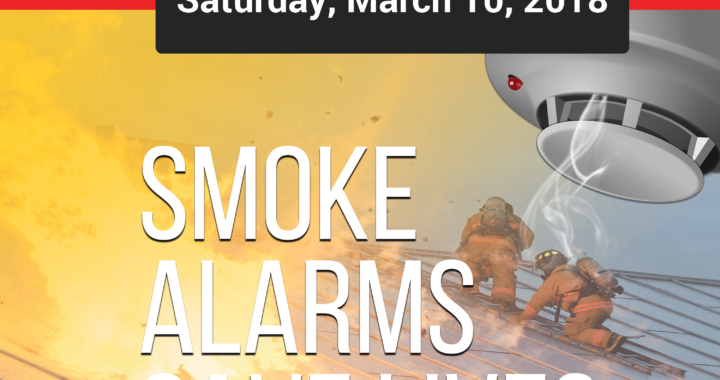 Event sponsorships are also available. It replaces the more standard green market that had occurred off and on over the years at the Marina, which is operated by the Riviera Beach CRA and is undergoing the second phase of its multi-million-dollar redevelopment. This new feel works, says Scott Evans, the RBCRA’s executive director. The RBCRA has already booked vendors selling the food and merchandise of the islands and a DJ who will play the Soca, Calypso, Kompa and Rake ‘n’ Scrape–the latter being Bahamian music–that originated in the islands of the Caribbean. A grand opening event will occur next Sunday, same time and place, but with a broader array of offerings. 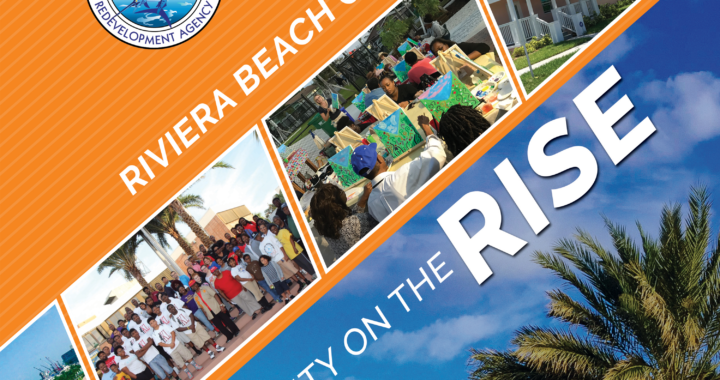 © 2015 Riviera Beach Community Redevelopment Agency. All Rights Reserved.